A team led by researchers at UC Santa Cruz has developed chip-based technology for reliable detection of Ebola virus and other viral pathogens. 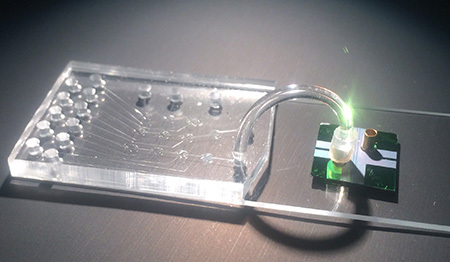 The system uses direct optical detection of viral molecules and can be integrated into a simple, portable instrument for use in field situations where rapid, accurate detection of Ebola infections is needed to control outbreaks. The lead authors of the paper are postdoctoral researcher Hong Cai and graduate student Joshua Parks, both in Schmidt's lab at UC Santa Cruz. A team led by Aaron Hawkins at BYU fabricated the silicon-based optofluidic chips. Virologist Jean Patterson led the team at Texas Biomedical Research Institute that prepared viral samples for testing. This research was supported by the W. M. Keck Center for Nanoscale Optofluidics at UC Santa Cruz and grants from the National Institutes of Health and the National Science Foundation.